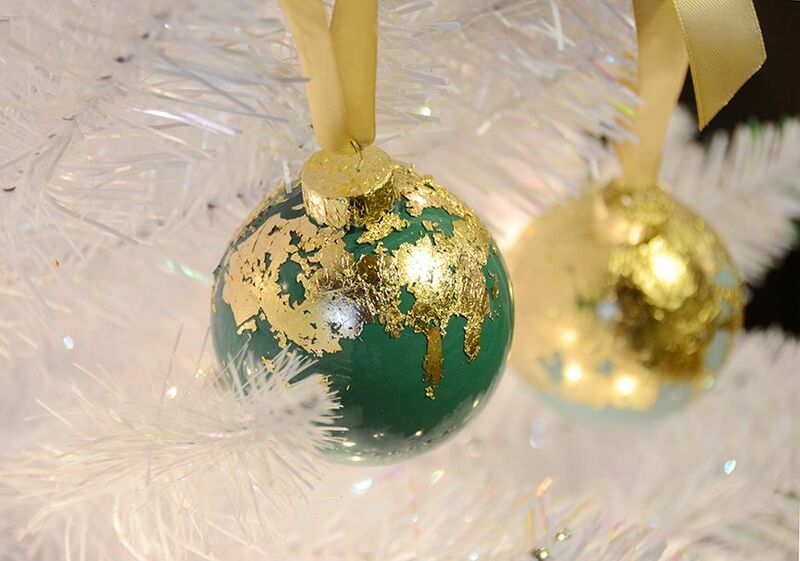 Give your holiday decor some extra sparkle this year, with these beautiful gold leaf glass ornaments. 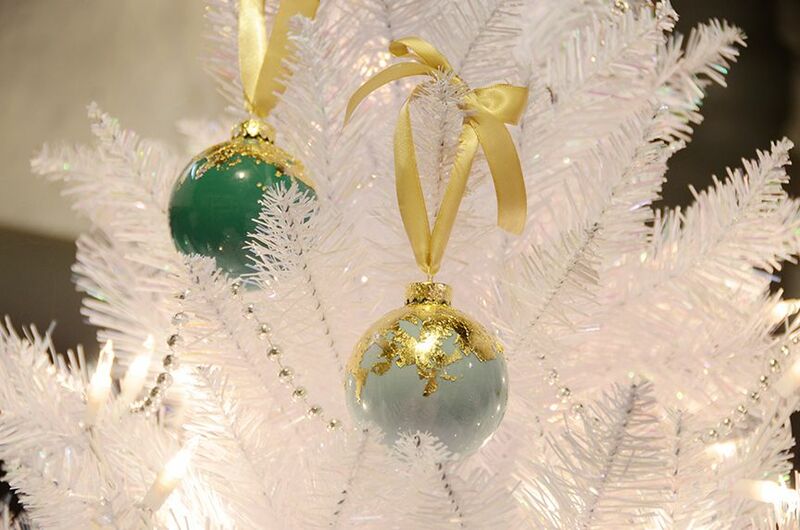 They are the perfect addition to a contemporary Christmas tree, and they even look pretty in a decorative bowl on the coffee table. Keep reading to check out the surprisingly easy process. 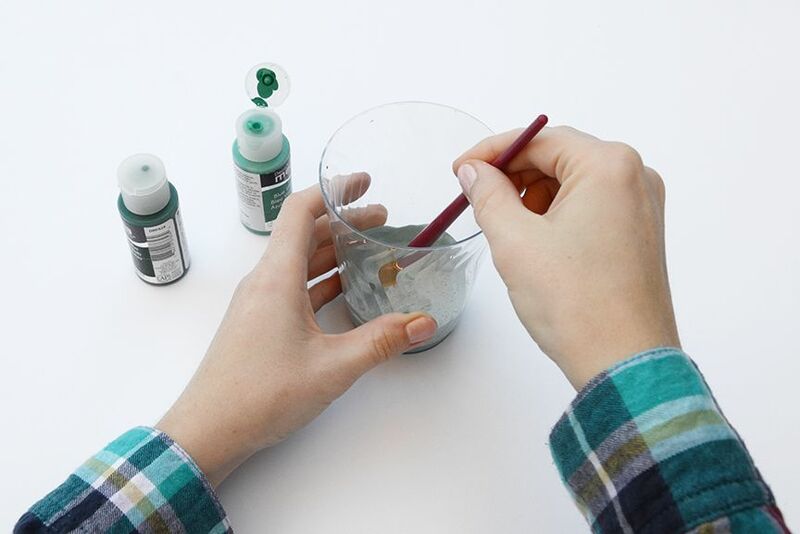 Begin by mixing your paint in a plastic cup. You may need to combine a few different colors to get the perfect shade. Add a few drops of water to the mixture to thin it out a bit. 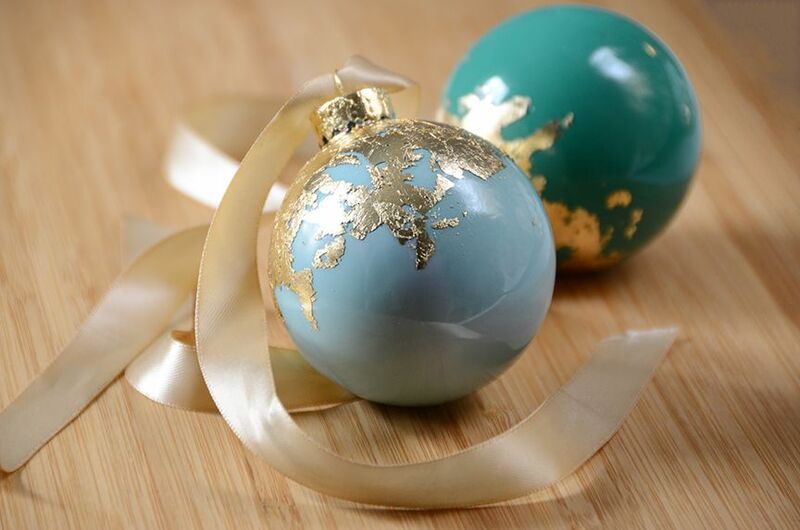 You should aim to have about three tablespoons of paint so that you can coat the entire inside of the ornament in one go. 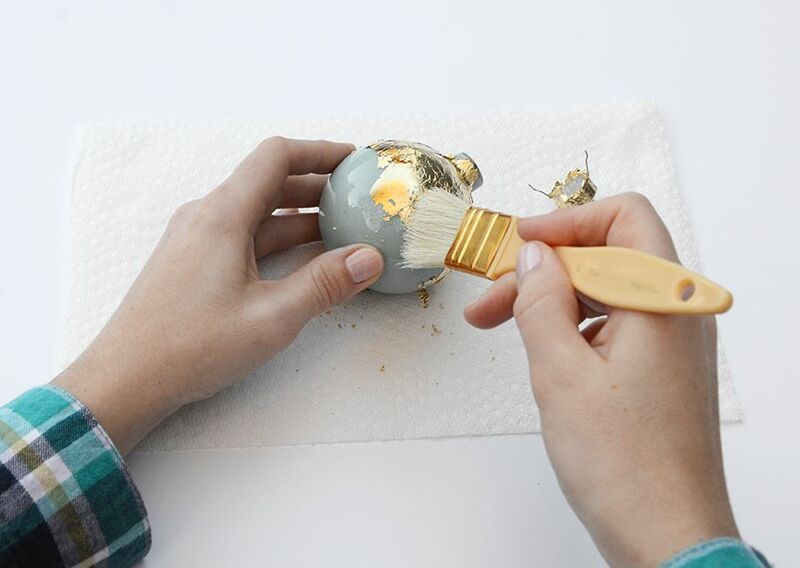 Remove the metal cap on the ornament and carefully pour the paint into the glass ornament. Go very slowly so you don’t accidentally spill on the outside of the ornament. If this does happen however, simply wipe off the excess using a damp paper towel. 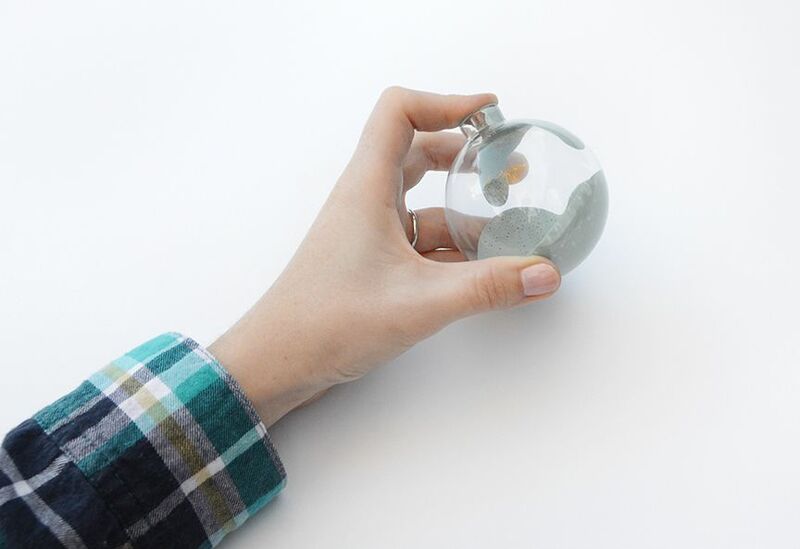 Place your finger over the opening (or a folded piece of paper towel if you don’t want to get paint on your hands) and move the ornament around until paint covers the entire interior of the ornament. The small air bubbles will work themselves out as the paint dries. 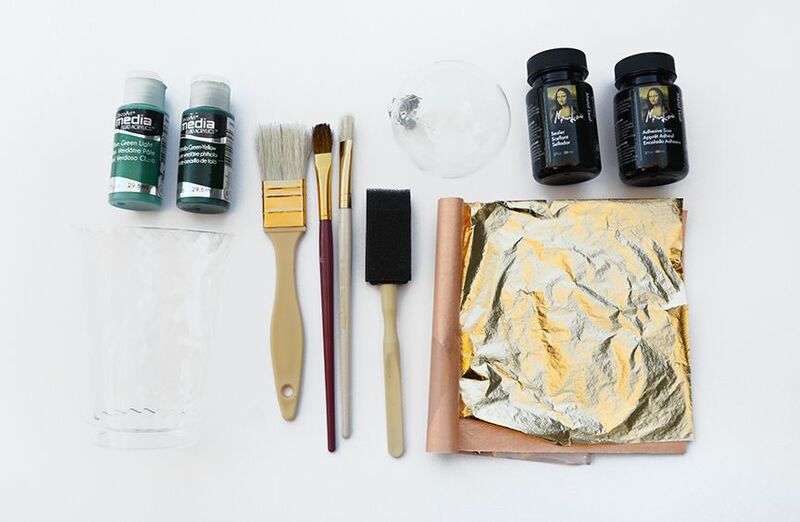 Pour the excess paint back into the plastic cup and set the ornament aside on a paper towel to dry. Move it periodically so excess paint doesn’t settle in one spot. Next, use a brush to apply the “adhesive size” to the metal ornament cap as shown above. Set it aside to dry until the adhesive feels tacky. 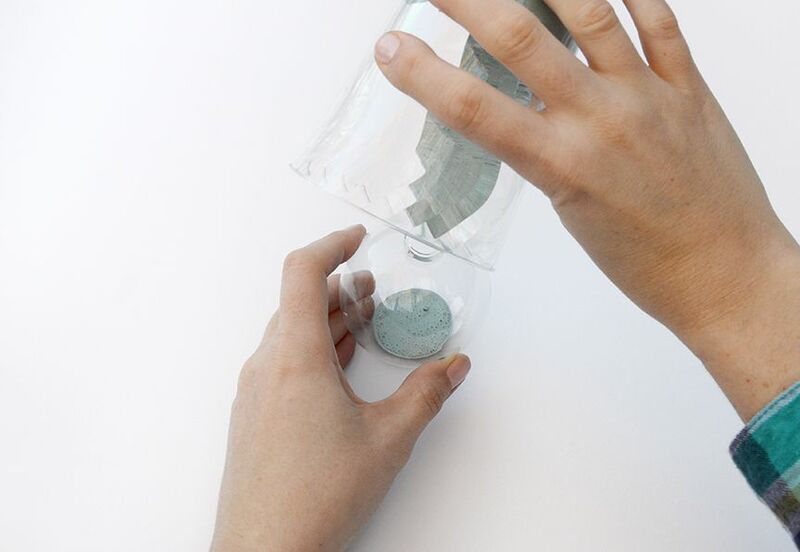 Apply the adhesive to the top of the glass ornament as well. 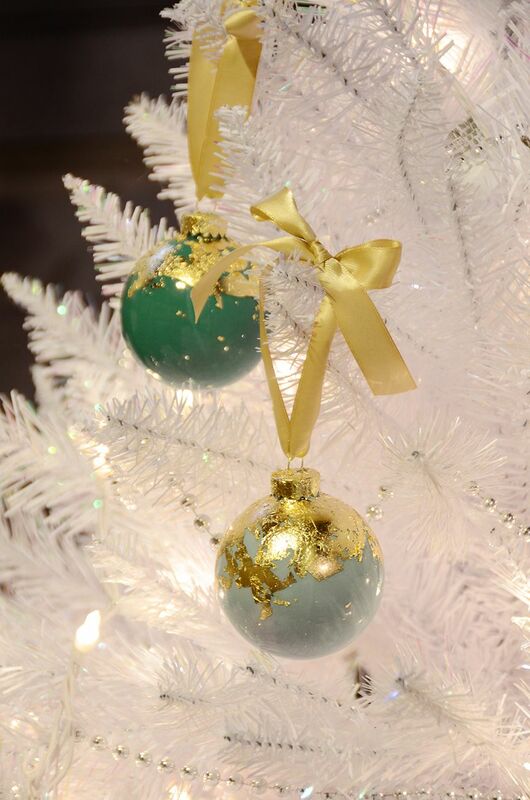 As you work your way down toward the bottom of the ornament, use less and less adhesive. Now put this aside to dry until it is tacky as well. 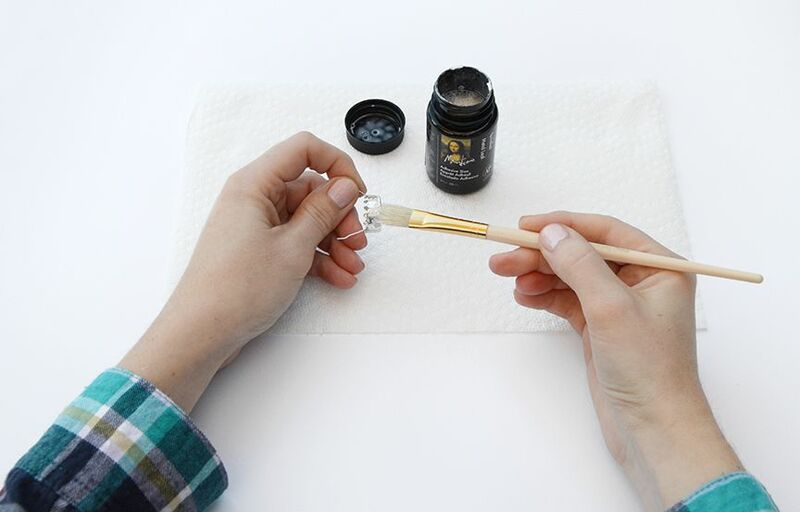 Gently place a piece of gold leaf across the surface of the metal cap. Continue covering it with leaf until the entire outside is covered. Ignore the excess gold leaf for now. 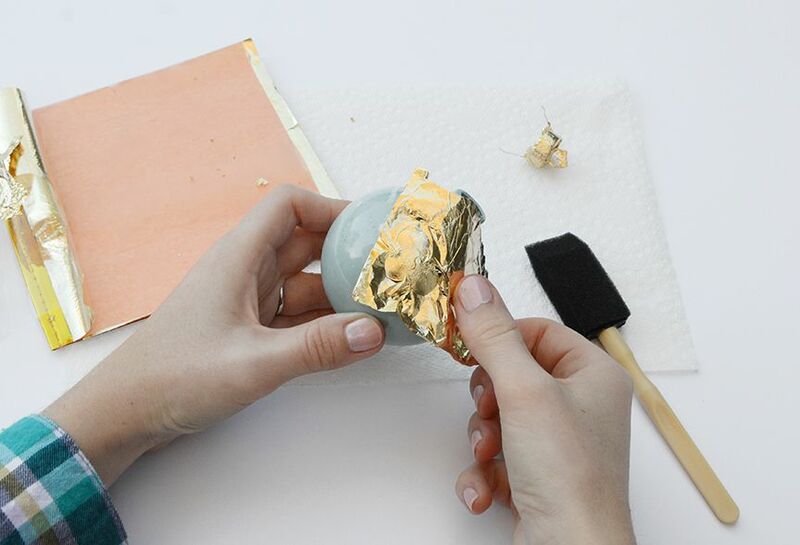 Repeat the process for the ornament itself, covering the areas with adhesive with gold leaf. 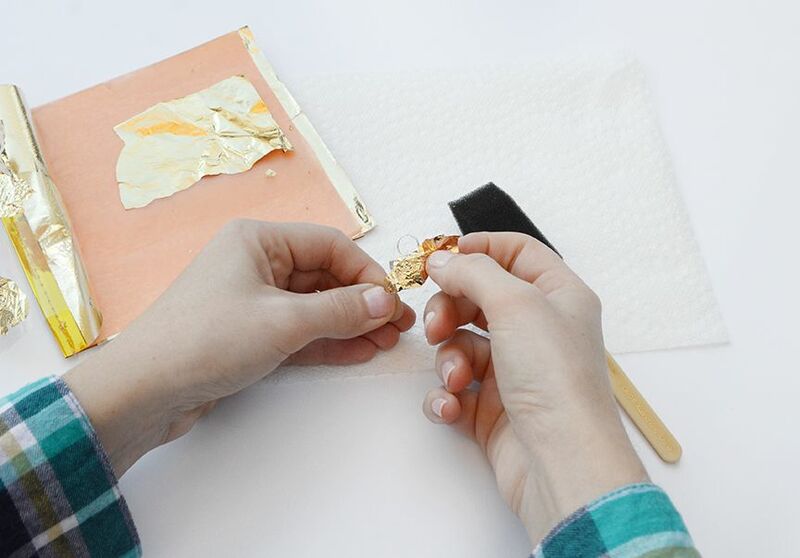 Once everything has dried thoroughly, use a dry brush to gently remove the excess gold leaf. 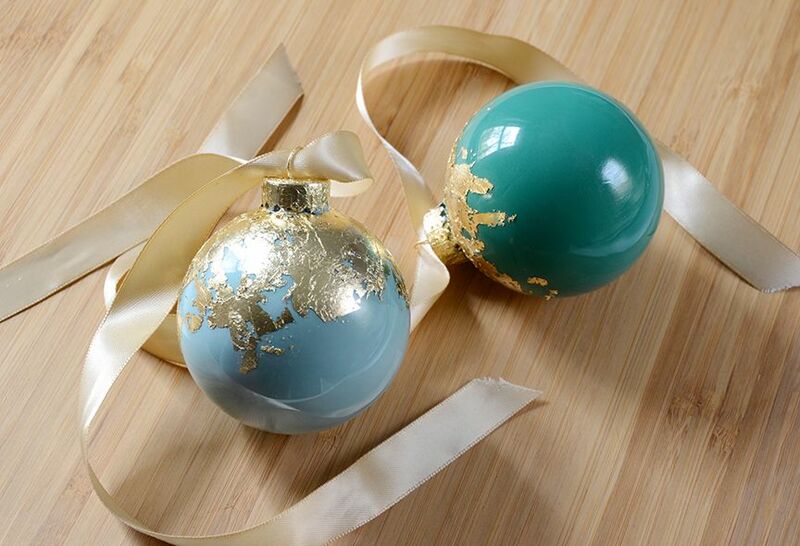 You may want to use the included sealer if you’ll be handling the ornament often. Add a pretty gold ribbon to the top and tie it in a bow so you can hang it on your Christmas tree. You can use any color you like – a dark berry red would be a beautiful, more traditional choice. You might also consider placing a handful of them in a decorative bowl, or attaching them to a pretty garland. 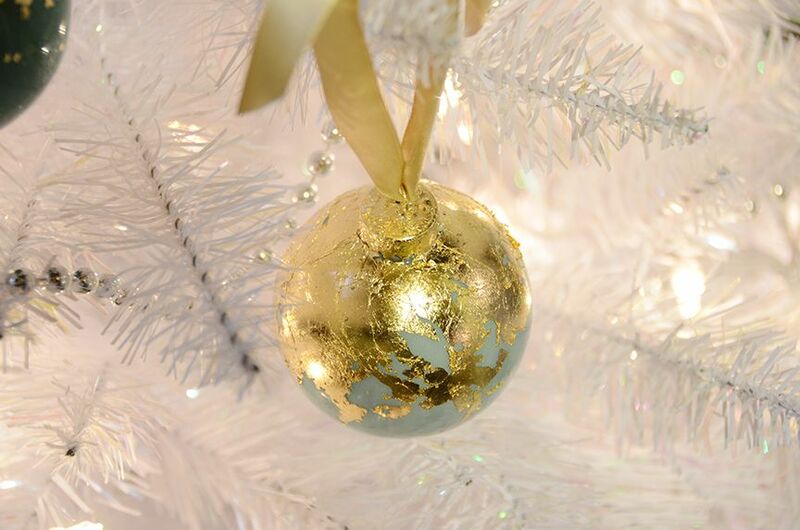 The gold leaf has a gorgeous glow with the surrounding string lights, adding a pop of elegance to any space. Happy holidays everyone!